Made from a knotty grade of wood, "Rustic Pine Wine Rack Kits" are sought after for their rustic beauty. Nothing compares to our Rustic Pine for price, quality and strength. Mix and match to create your personalized wine cellar! 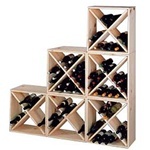 All wine rack kits are 72” high, 8 3/4” deep and are easy to assemble. This wine rack collection was designed to accommodate wine bottles that are 2 ¾” - 3 1/4” in diameter. To maximize the depth of your space, two components can be attached with our special braces. Structurally designed to accommodate additional wine storage above racking. All hardware is included. The Country Pine 3 Column Individuals is 21 rows of storage and holds up to 63 bottles with 3 bottles stored on top. The Country Pine Solid Bin Rack is constructed of sturdy 1 x 10 pine and has 24 open bins for a storage capacity of 208 bottles. This curved individual wine rack kit makes an excellent solution to attractively store your wine where a 90 degree directional transition is needed, or just to add creativity to the design of the wine room. Maximize your storage by expanding the Redwood Rack kits from single deep bottles to double deep bottles. Country Pine Open Diamond Cubes are 1 column wide x 3 cubes high. Each cube has 4 quadrants holding 10 bottles for a total of 40 bottles. Country Pine Solid Diamond Cubes are 1 column wide x 3 cubes high. Each cube has 4 quadrants holding 10 bottles for a total of 40 bottles. Free Freight! Country Pine Cubes are affordable, sturdy, stackable and expandable. Each compartment holds six bottles and the four compartments equal two cases of wine. Made of solid unfinished pine. Stackable scalloped crossbars fit snugly into the endpieces. A snap to assemble.